Hunting for biotech stocks that won't make you queasy? Our contributors think these three belong in a long-term portfolio. Biotechnology is one of the riskiest industries to invest in, but it's also one of the most lucrative for long-term investors. The best biotech stocks often provide market-thumping returns, but the ups and downs along the way can be violent enough to make holding on difficult. The iShares Nasdaq Biotechnology ETF (NASDAQ:IBB), which tracks an index of most biotech stocks traded on the exchange, is prone to double-digit swings from week to week. The ETF is currently down about 30% over the past year, but the need for new drugs hasn't abated. This means there are some inexpensive stocks in this industry. We asked three Motley Fool contributors which biotech stocks they would happily buy and hold through any storm. Here are their picks. Brian Feroldi: Biotechnology stocks have been under a lot of selling pressure all year long, causing valuations of even the strongest names from the group to decrease. That means right now could be a great time to go bargain hunting, and Regeneron Pharmaceuticals (NASDAQ:REGN) is at the top of my personal shopping list. Unlike most biotech companies, Regeneron Pharmaceuticals is already highly profitable. That's largely owed to the tremendous success of Eylea, its blockbuster treatment for wet age-related macular degeneration. Eylea has been on the market for several years now, but it's still firmly in growth mode. Management is projecting sales growth in the U.S. of at least 20%, even though its actual growth rate of 44% in the first quarter barreled past that target. But there's far more to this growth story than just Eylea. Last year, Regeneron and its partner Sanofi launched Praluent, which is a new type of cholesterol-lowering medicine. Thus far, sales of Praluent have been uninspiring, but that could change in a hurry if data from its ongoing cardiovascular outcomes study shows that the drug prevents heart attacks. We should know more on this topic in the next few quarters. Looking a bit further down the road, Regeneron could possibly have two other blockbuster drugs coming online shortly. The first is Sarilumab, a potential treatment for rheumatoid arthritis. The compound is already in the FDA's hands, and a go/no-go decision is expected by Oct. 30. The second is Dupilumab, which holds promise as a treatment for moderate to severe atopic dermatitis and eczema. This drug should be submitted for regulatory clearance next quarter. When added together, Regeneron holds the potential to have four potential blockbusters drugs on the market within 18 months. That gives investors multiple shots on goal, and even if they don't all pan out, it's not hard to believe that this stock is primed for some serious growth. With shares now trading for roughly 23 times next year's earnings estimates, I think this is stock is a great buy and hold candidate. Keith Speights: One biotech stock I plan to hold onto for a long time to come is Celgene (NASDAQ:CELG). I think now is a great time for long-term investors to take a look at this biotech. At first glance, you might think Celgene's price is steep with an earnings multiple of nearly 51. That's a rearview mirror number, though; the biotech stock now trades at less than 15 times forward earnings thanks to the slump experienced by Celgene and other biotechs over the past year. It's Celgene's future prospects that make it a solid buy-and-hold pick. The company's biggest moneymaker, Revlimid, generated revenue of $5.8 billion last year. Sales for the blood cancer drug continue to grow, with approval for more indications potentially on the way. Celgene isn't a one-trick pony, though. Abraxane and Pomalyst/Imnovid appear to be on track to bring in more than $1 billion each in 2016. Otezla made nearly $472 million in 2015, its first full year on the market. The plaque psoriasis and psoriatic arthritis drug could garner around $800 million in sales this year. In addition to these successful drugs already on the market, Celgene boasts a strong pipeline. Ozanimod stands out as the most exciting pipeline candidate. The multiple sclerosis drug is expected to reach peak annual sales between $4 billion and $6 billion. And if all of that good news isn't enough, Celgene has a nice cash stockpile of $5.73 billion. The biotech is using some of its money for share buybacks. I wouldn't be surprised to see another strategic acquisition at some point, though. Cory Renauer: There are three key features I look for in stocks to buy and hold for the long term: strong profits, ability to grow those profits, and a willingness to return them to shareholders. Gilead Sciences (NASDAQ:GILD) is firing on all cylinders but trading at just 7.2 times this year's earnings estimates. Gilead is cheap because the market thinks the company has peaked, which, on the surface, is a reasonable assumption. Over the past few years, tremendous success with two hepatitis C antiviral drugs pushed annual earnings from just $1.81 per share in 2013, to $11.91 per share last year. This year, it's only expecting sales to reach between $30 billion and $31 billion, a notch below the $32.2 billion reported last year. When investors saw first-quarter sales of its top-selling product, Harvoni, slump 11% from the previous quarter to $3.02 billion, it's easy to see why they're running for the exits. New hepatitis C antivirals, Zepatier from Merck & Co. and Viekira Pak from AbbVie, have been pressuring sales of Harvoni in the U.S., but these two can't hold a candle to Gilead's recently approved Hepatitis combination pill, Epclusa. Viekira Pak only treats the most prevalent strain, and Zepatier treats two. Most importantly, these two competitors often require adding poorly-tolerated ribavirin to the regimen. With the exception of patients with moderate to severe cirrhosis, treatment with Epclusa doesn't require the nasty stuff. Looking further ahead, there are six main strains of the virus, and Epclusa is the only one that treats them all. This makes viral genotype testing unnecessary, and it makes Gilead's new combo the only sensible option for millions infected with hepatitis C in the U.S., Canada, Western Europe, and tens of millions worldwide. Gilead's hepatitis C franchise still has plenty of room to grow. 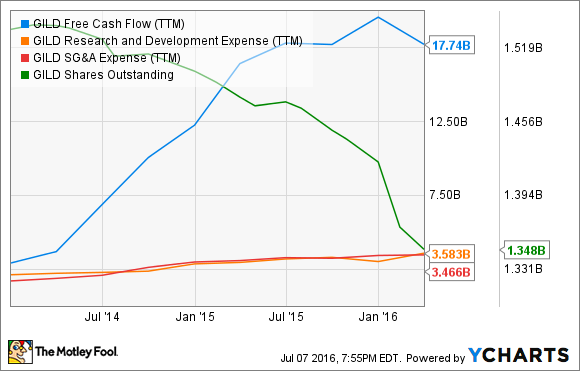 GILD Free Cash Flow (TTM) data by YCharts. Trailing-12-month free cash flow dipped from a peak of $19.6 billion in Q4 2015 to just $17.74 billion when Gilead reported first-quarter results. Rather than bloating up operations, the company has been using those massive cash flows to repurchase an astounding number of shares and initiate a dividend program, which, at recent prices, offers a yield of about 2.2%. With strong cash flows, a means to keep them growing at a reasonable pace, and a habit of returning them in the form of dividends and buy-backs, this is one stock that will be easy to hold for the long run.